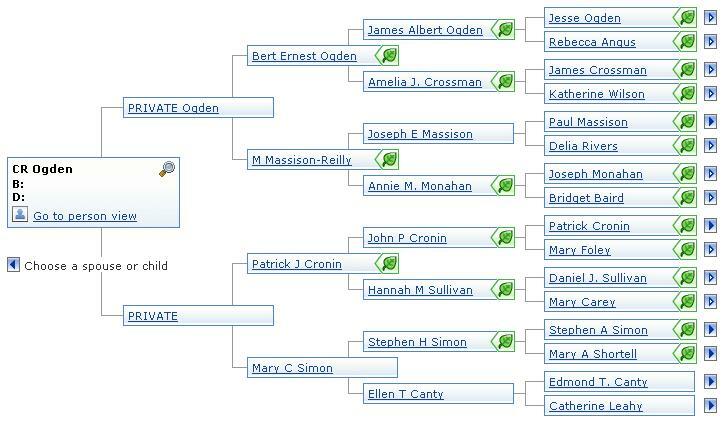 genealogy of the Ogden & Cronin families of Massachustts; includes the following surnames: Ogden, Cronin, Blood, Massison, Simon, Crossman, Monahan, Sullivan, Canty, Leahy, etc. I just added my familty tree data to the Acestry.com website. To check it out, click here (it's also listed under links to the left). You may need to have an Ancestry.com account to view the tree on their site. That's OK though, because you can see it all on my website! (www.ogden-cronin.com) A link to my website is at the top of the left-side column. I plan to post information related to my ancestors - in the hope that someone might stumble upon here with new information. If you have ANY info to add or correct, or if you find my information helpful please let me know. I have been researching my genealogy since 1996. John Simon - Pirate from Bordeaux? Site maintained by Charlie Ogden. Awesome Inc. theme. Theme images by Lokibaho. Powered by Blogger.